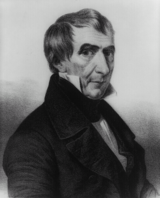 William Henry Harrison was the 9th President of the United States. Died: April 4, 1841. He died in Washington D.C. of pneumonia a month after taking office. He was the first president to die in office. What is William Henry Harrison most known for? He is most known for being the first president to die in office as well as for serving the shortest term of any president. He was only president for one month before he died. William grew up part of a wealthy family on a plantation in Charles City County, Virginia. He had six brothers and sisters. His father, Benjamin Harrison V, was a delegate to the Continental Congress and signed the Declaration of Independence. His father was also governor of Virginia for a time. William attended various schools and was studying to become a doctor when his father died. After his father died, William ran out of funds and decided to join the army. He was assigned to the Northwest Territory to help battle Native Americans in the Northwest Indian War. After Harrison left the army, he entered politics. His first position was as the Secretary of the Northwest Territory. He soon became the territory's representative in the U.S. House of Representatives. Here he worked on the Harrison Land Act which helped people to buy land in smaller tracts. This helped the average person to buy land in the Northwest Territory and helped to further the expansion of the United States. In 1801, he became Governor of the Northwest Territory after being nominated for the job by President John Adams. His job was to help settlers move into the new lands and then protect them from the Native Americans. The Native Americans began to resist settlement in the Northwest Territory. A Shawnee chief named Tecumseh tried to unite the tribes against the Americans. He said they had no right to take over their lands regardless of whether certain tribes sold land to the U.S. or not. Harrison disagreed. Harrison and his soldiers were attacked at Tippecanoe River by some of Tecumseh's warriors. After a long battle, the Native Americans retreated and Harrison burnt their town to the ground. Harrison became famous for his victory over the Native Americans at Tippecanoe. He even gained the nickname Tippecanoe and was considered a war hero. It was partially his fame gained from this battle that helped him to be elected to president. When war broke out with the British in the War of 1812, Harrison became a general in the army. He led his troops to one of the major victories in the war at the Battle of the Thames. After the war ended, Harrison took up a life in politics. He served as a member of the House of Representatives, as a U.S. Senator, and as the U.S. Ambassador to Columbia. Harrison ran for president in 1836, but did not win. He was part of the Whig party at the time and they had several candidates run for office in an effort to try and beat then Vice President Martin Van Buren. In 1840, the Whig party chose Harrison as their only candidate for president. Since the public largely blamed President Van Buren for the panic of 1837 and the bad economy, Harrison was able to win. Harrison died 32 days after being inaugurated as president. This is the shortest time anyone has been president. He gave a long (well over an hour!) speech while standing in the cold rain during his inauguration. He didn't wear a coat or wear a hat. He caught a bad cold which turned into pneumonia. He never recovered and died a month later. He was the last president born before the United States became independent from Great Britain. When William asked his future wife's father if he could marry his daughter, he refused. As a result, William and Anna eloped and got married in secret. The plantation that Harrison lived on during childhood was attacked during the Revolutionary War. The great Indian leader Tecumseh was killed at the Battle of the Thames. William's grandson, Benjamin Harrison, became the 23rd President of the United States.